Woodcock 'roding' over woods in the evening. 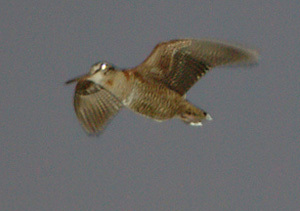 A rare image of a Woodcock in flight, note the light barring on the underside and the bill pointing down. Also note the silvery-white under-tail feathers. The camouflage pattern and the favoured habitat of woodland, make the Woodcock an extremely hard bird to observe when on the ground. Most often it is seen flying with it's bill pointing downwards in a distinctive manner. Note the barring on the birds head and the mottled leaf like upperparts. When the Woodcock takes off it is usually right under the feet of the observer, making a very loud clatter, and taking off nearly vertically. It is not uncommon for people to be quite startled by the sudden activity. 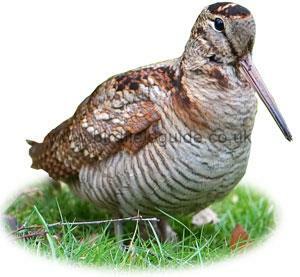 The Woodcock is a large heavy bird with long straight bill, and brown leaf patterned body. It has blackish bars on the back of it's head and is usually seen as it fly's from the observers feet, with a loud clatter of wings. Widespread in Europe, moving South in the summer to nest in North and central Europe. Winters in Southern Europe. 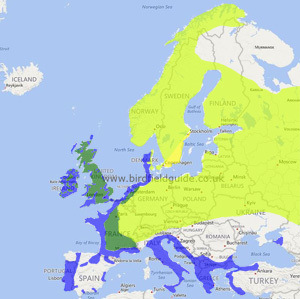 Birds in Central France and the UK are mostly resident, rarely moving very far. 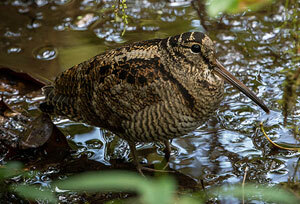 Lives in marshy woodland, nesting in drier areas nearby. In harsh cold weather it will often move out to ditches and farmland in search of food. The Woodcock is known for 'roding'; Flying over woodland at dusk, in spring, calling and performing flight maneuvers in the hope of attracting a mate. Woodcock feeding out in the open, probably due to harsh, cold weather.